After hearing the Resort Loop Podcast episode 436, about Tim and Bob’s experience at Tiffins, I wanted to add a blog article to go along with it. Back in September of 2016 Deb & I had our first experience at Tiffins and it instantly became our favorite restaurant at the Walt Disney World Resort. The restaurant (and adjoining lounge) is an amazing combination of visual theming, great food and outstanding service. For this article I wanted to share a photo tour of our experience. 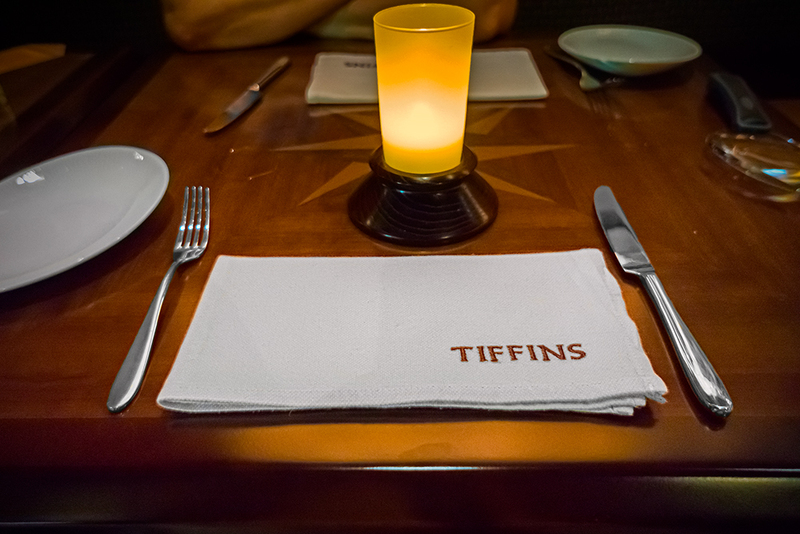 It’s important to note – like all of Disney’s signature dining experiences – Tiffins is not cheap. 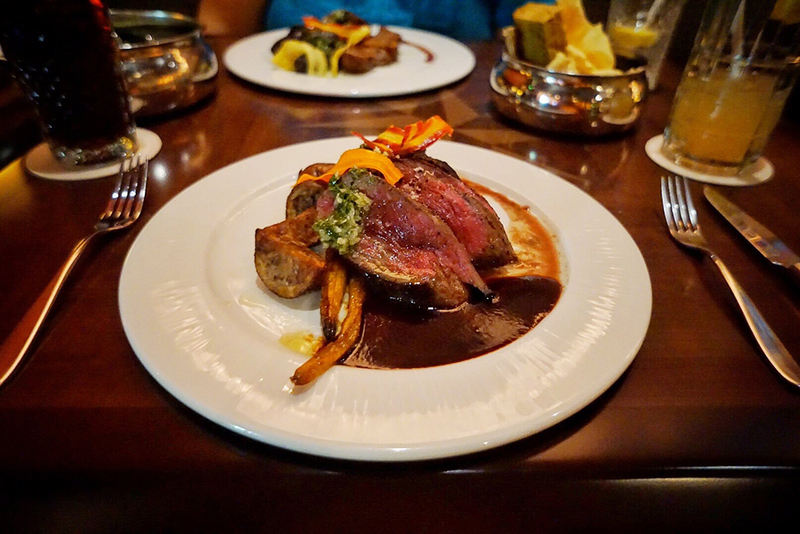 A signature restaurant can be found at all of Disney’s deluxe resort hotels, as well as in the Theme Parks, and they’re meant to deliver dining at it’s finest and that often comes at a price. Until the opening of Tiffins, the Animal Kingdom was the only Walt Disney World theme park without a signature dining experience. 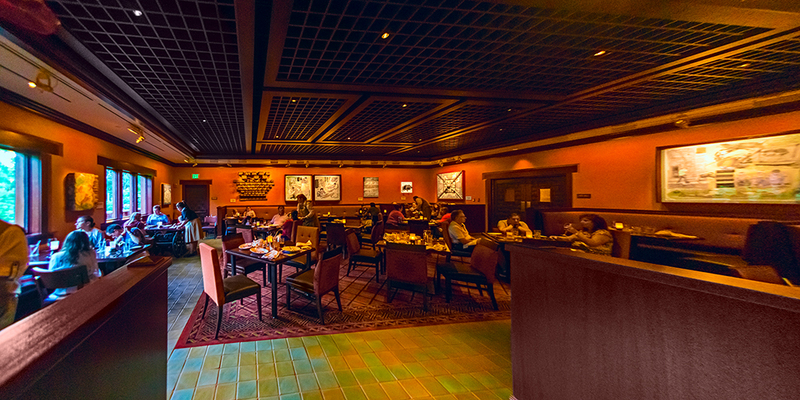 With the opening of Tiffins all is as it should be at the Walt Disney World Resort when it comes to signature dining options. 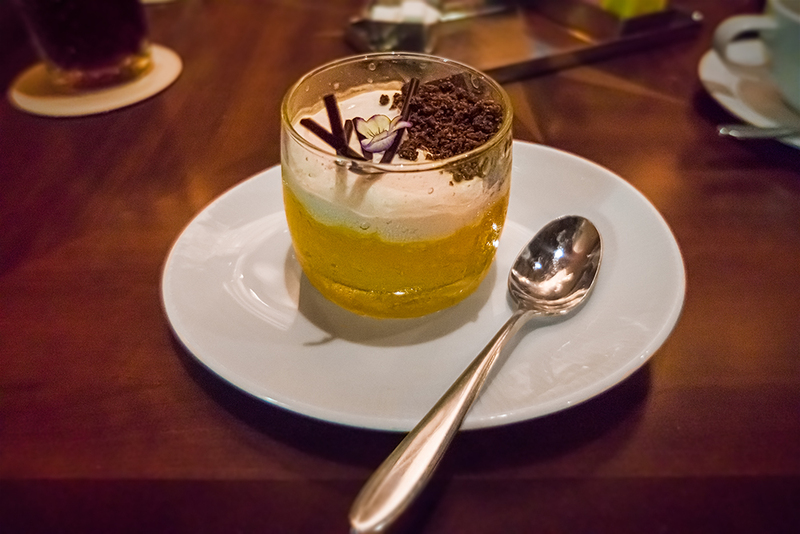 Even though it’s one of the newest restaurants at the Walt Disney World Resort, it’s reputation has been solid since day one and our experience, like Tim and Bob described in the podcast, was exceptional. After the announcement of Pandora – the World of Avatar, Disney World began construction on areas that would become entrances to the new land. 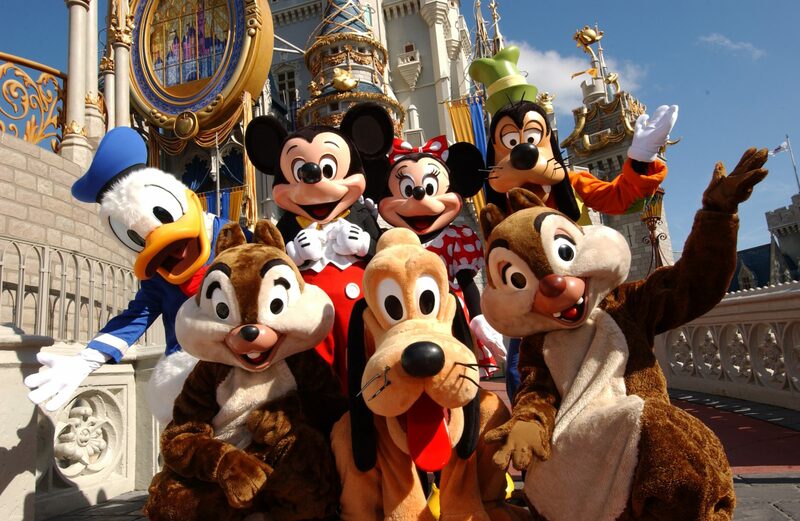 The area that used to be called Camp Minnie Mickey was going to change in a big way. One of the more popular shows, the Festival of the Lion King, needed a new home. It was relocated to an unused area behind the Tusker House restaurant (part of an expanded Harambe Village) and the results, in my opinion, are awesome. The Harambe Market added a new themed quick service area and the walk behind Tusker House feels like it was always there. This entire area is more fun than ever and it really comes alive after the sun sets (but that’s a topic for another article). 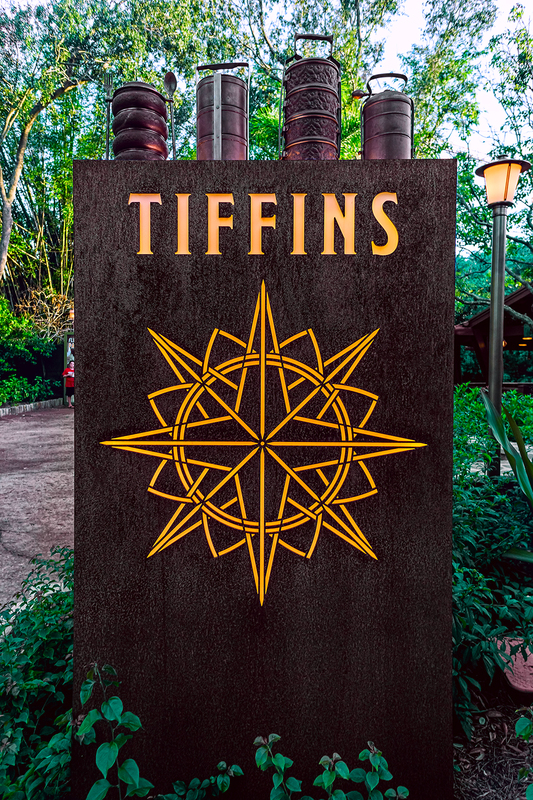 Tiffins is located in the area where the old Festival of the Lion King theater used to be and it’s on a path that will take visitors to Pandora. The exterior theming blends perfectly into the park and, if you didn’t know it was there, you just might walk by without noticing it. Personally, I like that it’s not calling attention to itself. 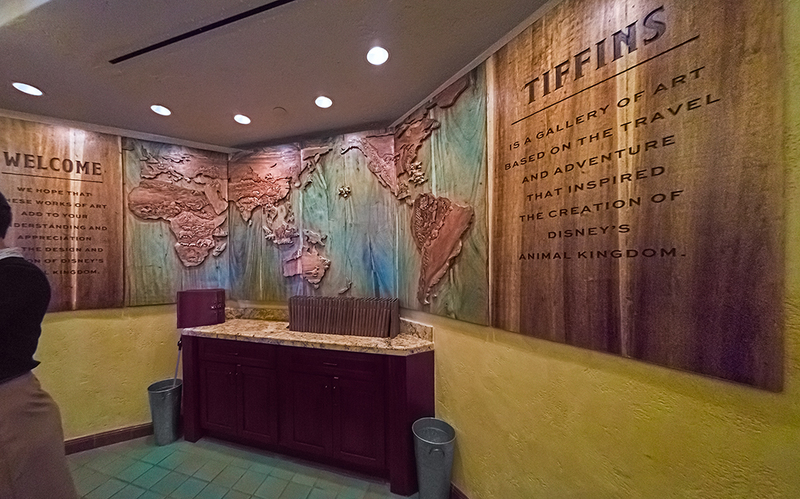 The entrance to Tiffins is at the end of a covered walkway. On the wall behind the counter is a beautiful map of the world where all the continents are made of wood with animals carved into them. On one side of the world map is a welcome greeting and the opposite side has a brief description of the restaurant’s inspiration. 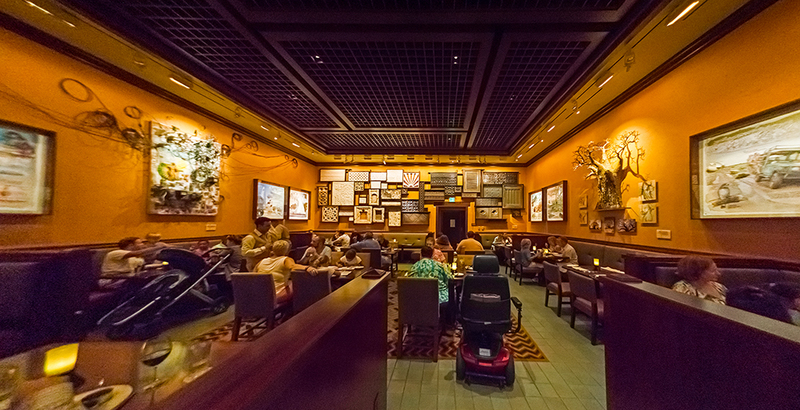 This area was a beautiful introduction to the dining experience that was to come. Deb and I always try to arrive early for a dining reservation. That gives us plenty of extra time to explore and I’m extremely happy we did. 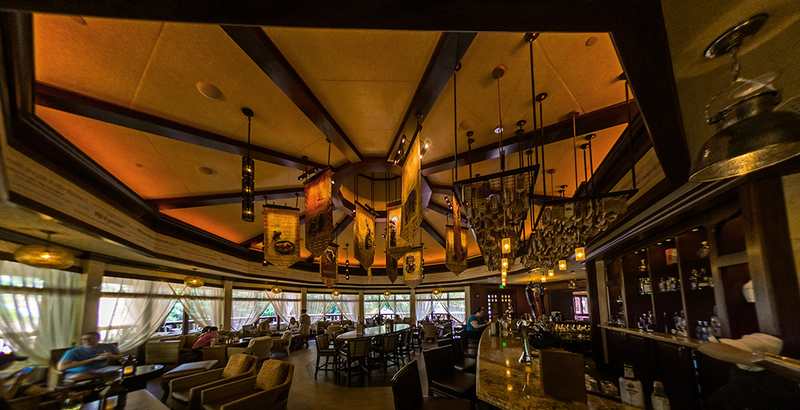 We were so early, in fact, we made our way over to the connected bar area, the Nomad Lounge. It was pretty empty on the day we visited, but I’m pretty sure that won’t last long once people discover this hidden gem. Inside it’s absolutely spectacular! The theming really emphasized the traveling theme of Tiffins perfectly. * For readers who are interested, the Lamu Libation contains Starr African Rum, Cruzan Banana Rum, Guava purée, orange Juice, lime juice, pineapple juice and a topping of Gosling’s 151 rum. I found it to be a bit strong, but extremely tasty. Our bartender was super friendly and extremely helpful when I started asking questions about the lounge. On her recommendation we purchased an “Adventure Tale” to fill out with one of our travel adventures. Once it was filled out the paper tag was hung from the ceiling above the bar for anyone to read. In addition to the bar and lounge area, there was a pretty cool looking deck area outside. The Nomad Lounge even has it’s own entrance for people who won’t be dining at Tiffins. Because we had a dinner reservation we didn’t order anything to eat in the lounge, but a quick look at the menu had me wanting to return on a day when we knew we wouldn’t be eating in the restaurant. About halfway though our drinks our table was ready so we left the Nomad Lounge to begin our signature dining experience. 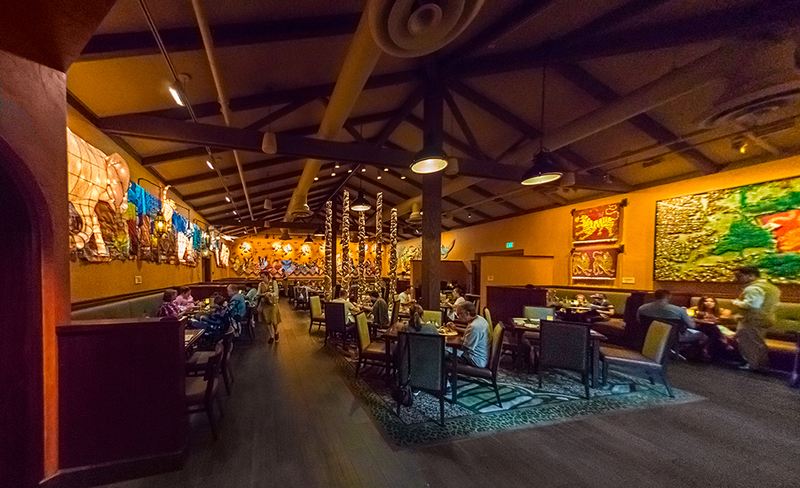 Tiffins has three distinct dining areas and each one looked like it’s own adventure story told in decorations. We were seated in the Grand Gallery where the walls were decorated with animal shapes reminiscent of floats you might see in the Rivers of Light show. Overall the room was dim with very warm colored lighting. It’s a room where no detail has been overlooked. One thing that I noticed when we sat down was the low amount of light in our gallery. This gives the room a spectacular ambiance but it does make taking pictures a bit tough. It also makes the menu really difficult to read. Thankfully the staff was ready with a really cool solution. When our server saw me using the light from my phone to read my menu, she brought over an illuminated magnifying glass. It was perfect! While this sounds like a small detail, it was one that really impressed me and quickly set the tone for how good our server was going to be. Our amazing server knew all the details about Tiffins we asked – and we asked a lot – including details about the many choices on the menu. While the descriptions on the menu are a great starting place, our waitress was invaluable when it came to giving us the little details that helped us decide what to order. For example, when Deb and I were trying to decide on appetizers we both skipped right by the octopus offering (neither of us are huge fans). But after our waitress described how it’s prepared we quickly reconsidered. 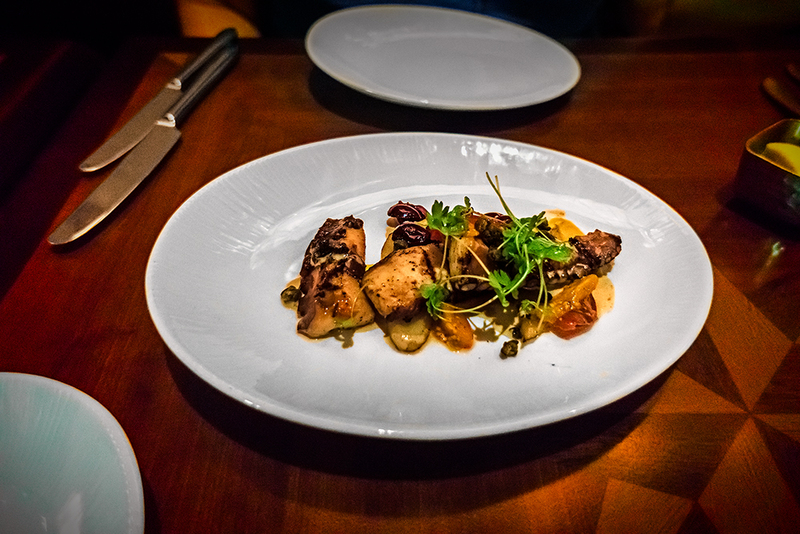 On the menu it’s called “Marinated Grilled Octopus” but believe me – that simple three word description does nothing to properly describe how amazing this appetizer is. Deb and I try to order two different items whenever we can to allow us to double the number of dishes we can sample. For our second app we ordered the Signature Bread Service. 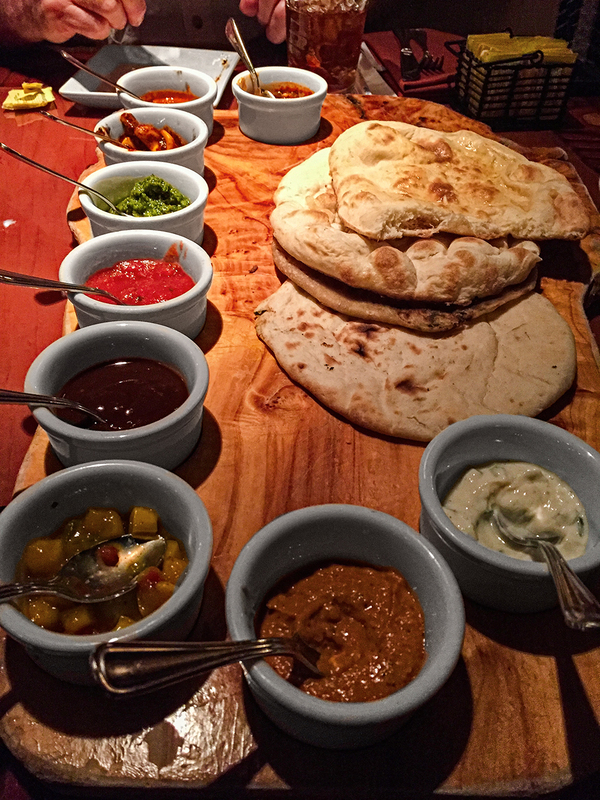 We’ve enjoyed a Disney World African style bread service before, at Sanaa, so we were eager to see how the Tiffins version compared. The Sanaa version is massive (especially when you opt for all nine of the accompaniments) and it takes up a considerable amount of table space. Savvy diners could easily make a meal out of one of these bread services. 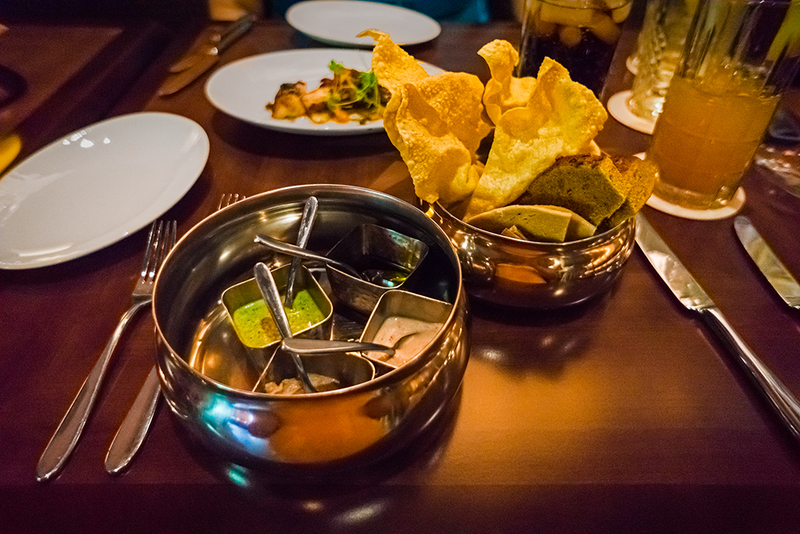 The Tiffins Signature Bread Service, on the other hand, is served in a very slick looking serving dish that contains four accompaniments and a smaller selection of breads. It’s not as big as the Sanaa version but the flavor is definitely there. Because this was only the first course of our meal I didn’t mind the smaller size at all. In fact, I thought it was perfect. With appetizers complete it was time to for our main course. For entrees Deb and I both decided on the Wagyu Strip Loin and Braised Short Rib. We’d both heard very positive things about the Wagyu and even our server reinforced how good it was. So, instead of trying two different entrees we bit the bullet and ordered what happened to be the most expensive item on the menu. The good news is that it didn’t disappoint. Every review I’ve heard or read about the Wagyu Strip Lion has been glowing and, after trying it, we both know why. 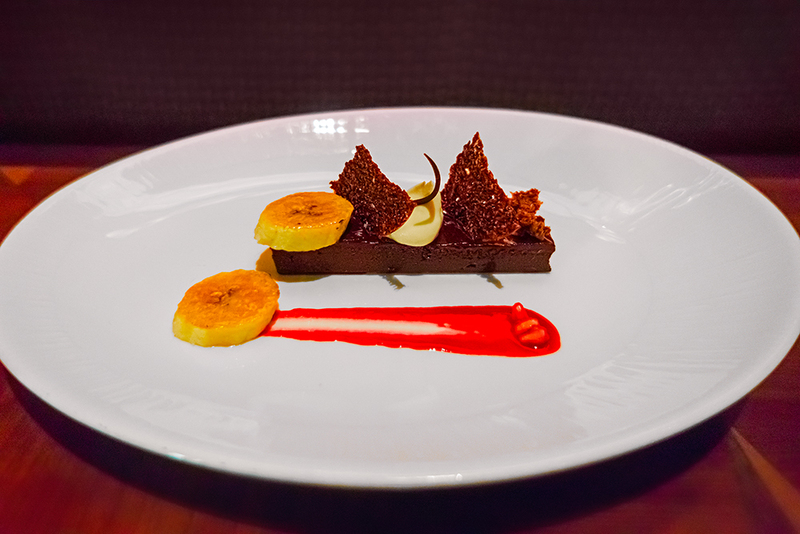 The presentation was incredible and flavor was everything I could have hoped for. 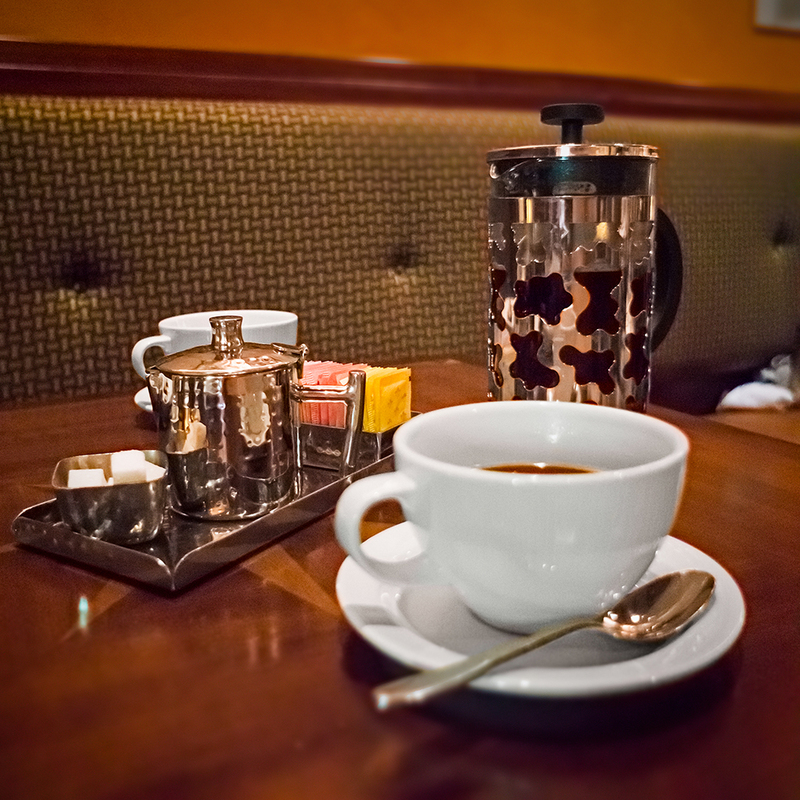 And to ensure the meal was perfectly finished we ordered a French press of Ethiopian coffee (provided by our good friends at Joffrey’s Coffee and Tea Company). 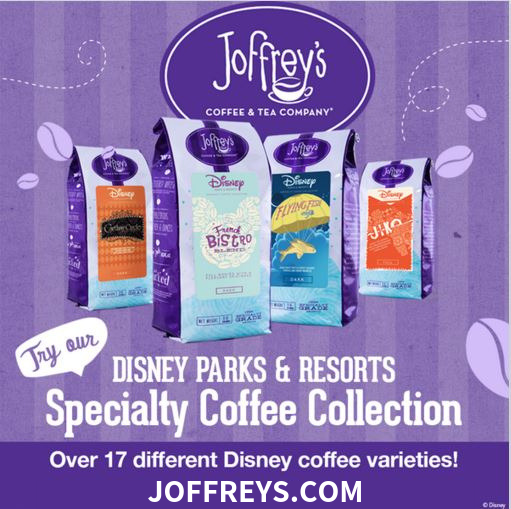 The Joffrey’s coffee was a perfect pairing to our desserts and we’re hoping a Tiffins Blend will be available for us to make at home soon. Before we wrapped up our awesome dining experience we had a chance to speak with the head chef and the restaurant manager and they couldn’t have been nicer. 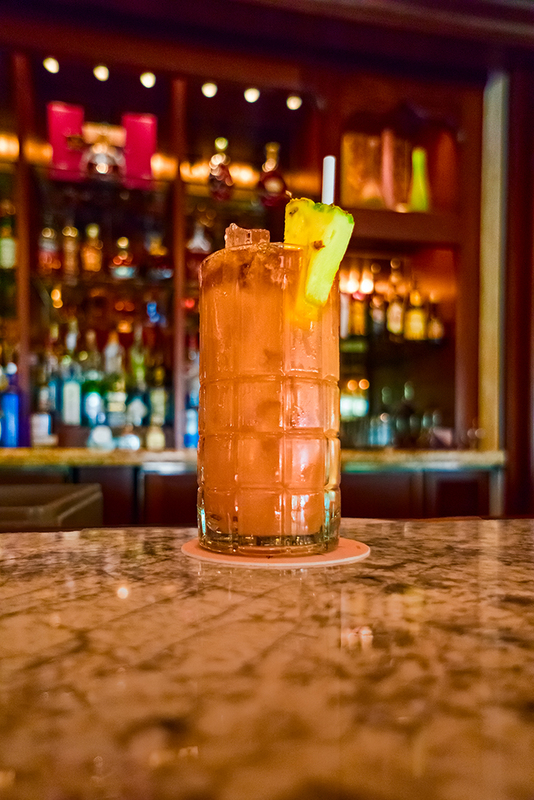 Chef John took some time to tell us all about the dishes we had as well as describing the brand new African-Spiced Waygu Beef Sliders that were going to be added to the Nomad Lounge menu a few weeks after our visit. The manager also had plenty of interesting stories to share and being able to thank both him and the head chef, personally, was a perfect way to bring our time in the Grand Gallery to a close. Oh – there is one last bonus we received before we left. 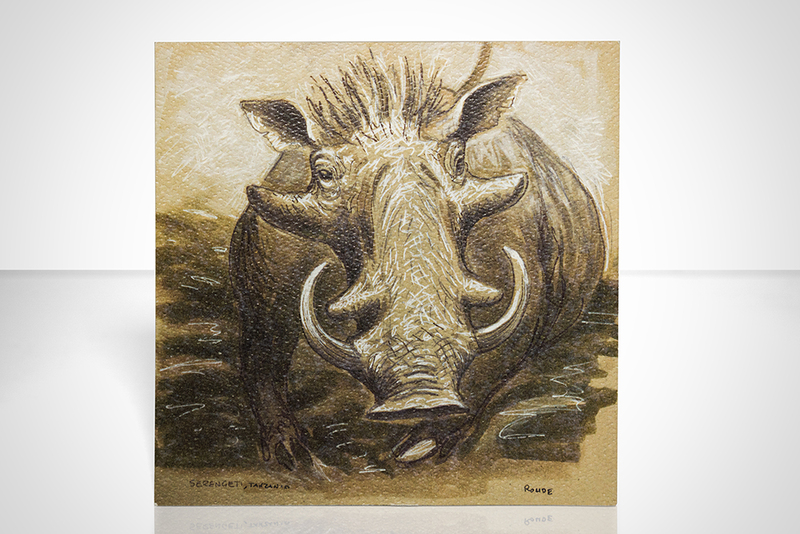 This Joe Rohde print was given to us as a lasting reminder of our incredible dining experience. 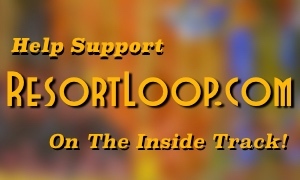 PreviousResortLoop.com Episode 451 – A Trip Review! I'm a photographer, designer, instructor and writer who lives in Virginia (just outside of Washington, DC). Robert Downey Jr. wants you to be his guest for Marvel’s Avengers: Age of Ultron!